Debate This: Train Once A Month For Massive Muscles! I don't set out to be controversial; I just report the facts as I see them, from user feedback from my book and my coaching clients and from feedback from the site. This article will no doubt be highly controversial as it is one of bodybuilding's hotly debated subjects. How often to train. It's up there with how much to eat and what exercises are best. This one is about the issue of how often to train and I don't just knock on the door, I blast it open by saying you can gain by training a body part - wait for it - once a month! Better type this out and then head for the Bunker and await the fallout! There are dark rumors afloat. Being whispered but never dared shouted. These rumors have abound for decades that secretly the major forces in the sports and food supplements industry do not want you to grow because they would go out of business. If people stay small then they can be relied upon to buy the latest 'miracle' supplement and those in power can push their new supplement as a 'key' to getting big or sell a new type of machine or system that builds muscle. "I had a conversation w/ a friend of mine who knows nothing about health/fitness/bodybuilding. It is seriously frightening how little people who don't pay attention to health know about being healthy." People who follow effective routines get massive and massive people do not need to buy over hyped supplements or equipment. They also get informed and this is dangerous for sales indeed. When people know the truth they wonder how they could ever have swallowed such nonsense, but it is natural and we approach what we read with an honest naivety believing that, surely, those who write the words we devour in mainstream magazines wouldn't lie to us. We want to grow as fast as possible and many magazines push long routines with numerous exercises that simply do not work for beginners or most bodybuilding mortals. Of course they work for anyone for the first few weeks because it is new to the body, and this traps many into the vicious cycle of training more and more, longer and longer. They stay small and so buy the magazines, the supplements and pay gym fees. They are trapped in this cycle by the spewing out miss-information and even outright lies. 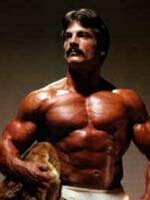 Anyone who dares spread the truth is attacked (like Mike Mentzer to name one) or their findings and information suppressed. It has got to the point where you can trust very little of what you read because behind the words is often a commercial, financial or political agenda. Dark rumors indeed. Short, brief but intense workouts are simply the explosive power that blasts down the walls that hold in your ultimate potential and will make you soar above those that will never amount to anything because they have their heads buried in the sand. It is not the ONLY way, of course not. But there are many ways up the mountain. You can enjoy the view on a nice leisurely walk, or you can grit your teeth and race to the top! I've seen enough trees and mountains... get to the top with me and HIT training, if I don't get to the summit, I'll get damn close. Authors such as Mike Mentzer, Stuart Macrobert and myself suggest that this method of training is the best way to go and few people who follow such routines fail to grow and become devout believers. After all if it was good enough for Mentzer and Dorian Yates, why would it not be good enough for you? The body responds pretty much the same in those that follow these routines because they are based on the science of how training effects the body. If we were all so different then the science of medicine and nutrition would be useless. If you train long, you train with less intensity. If you train too long somewhere along the line you hit your body's ability to recover from the workout. Also you must be holistic in your reps to cover all the muscle fibers (another article me thinks). You turn a muscle building routine into an aerobic routine which may get you lean (and get the illusion of having gained muscle, however it is more likely that your muscles are now more visible) but not massive. Of course there are exceptions but those are often the genetic elite that will grow just by looking at weights or simply by uttering the word like Arnold. You know him. That guy who made a few films and now wants to be president. A Tribute Fit For A King! A tribute for the 'The Oak', Arnold Schwarzenegger, 7-time Mr. Olympia. If you want to know about him then this is it. Here is a detailed history on the man himself-including his various careers, training, feedback, routines, and even a quiz for you! But we are almost doomed into doing more training than is good for us because the bodybuilding mentality easily slips into the 'more is better' frame of mind mainly because that is what we are told is the key. Not gaining? Take more drugs, more supplements. Still not growing? Then you are not training long enough or not doing enough exercises. Just take more supplements, more drugs and this will sort out your lack of gains- so we are told! The old timers trained three times a week, for an hour or so a session. They followed basic exercises often no more than two or three per body part and typically no more than three to four sets, and they grew fast. Drugs in most cases did not come into the picture in those golden days of bodybuilding. The 'secret' was hard, brief training and then lots of food and rest. They simply grew because they did not overstep their body's ability to recover and what muscle they did 'break down' was rebuilt with effective natural regimes. In other words they didn't over train. Over training will stop anyone from growing. It is better to slightly undertrain. Yes anabolic steroids and other drugs allow you to be train longer and still get some results but even then, why get 50% results when you could be hitting close to 100% each and every time? Even drugs have their limits on what they can compensate for and over training still hits chemically assisted athletes hard. For the natural to over train is, in progress terms, a death sentence for gains. Only when bodybuilding turned into big business that we suddenly had more machines and barbells and supplements that were advertised as having to be used to get anywhere and did routines get longer and longer. Then we had the drug dealers turned authors telling us we can train even longer if we use steroids, which often they would end up selling. Three sets or two exercises become 5 sets of 5 or more exercises. The people I know who are the biggest in my gym train very infrequently. They may visit the gym daily but they are careful not to over train. Overtraining is more a metabolic event, not a local one. It is when you over tax your entire body system. Agent-X, a top level competitive bodybuilder who contributes to Area9.net, has 20 inch arms cold and trains them once a week with one exercise for two sets. His best and fastest gains, which took him on to win no fewer than 5 top three places and one first, were when he trained a body part every nine days for no more than 20 minutes at a time. How many of you are spending that amount of time on ONE exercise? If something doesn't work then why keep at it? It's like in the Simpsons when Homer asks Moe how to get out of the hole he had dug himself into. Moe replies, "Keep Digging!" Nice going Moe. If you are not seeing changes at least on a monthly basis then you owe it to yourself to step back and re-assess what you are doing. To Re-assess What You're Doing. Stop digging and start climbing up the ladder. If it isn't working change it, or take up fly fishing. This article is not to preach, it is to make you stop and think about where you are going from here. If what you are doing isn't working then let's change it together. Have the faith to try shorter infrequent training and you will reap the benefits. It is all in your mind that your muscles will shrink or you will not gain as much if you train less. Running Biogenesis and Area Nine takes up a lot of my time and what with my writing thrown into the mix and a family life sometimes I cannot get to the gym, but my muscles do not shrink. Not if you eat smart and train smart. Time and time again people who ask me to write their training routines are gaining at unbelievable rates simply by cutting down on their training. Nothing else, no secret drugs or diets, just less training. A study last year showed that six in ten people who sign up to a gym quit within 6 months. Perhaps it is in the interest of those who make money from such things for people not to be shown the correct way to train. Throughout gyms I hear the 5 sets of ten to twelve reps, just push it on the last set, three to four exercises per body part philosophy. Of course people grow to begin with, people always grow when they start training regardless of what 'system' of training they do and are often doomed into thinking that they do not continue to grow because their body is 'used to it,' and they therefore have to add another set to the twenty they already do for their biceps. If people who stepped into the gym were told to train hard but infrequently they would grow but I guess they would also stay at the gym and that would stifle the gyms capacity for new memberships which would mean the gym would close. Cynical, perhaps, but with so much information around for such a long period of time on how to really train to get fast results I cannot see why the same old nonsense is dished out time and time again. Its not just bodybuilding that does this, many industries do it because that is how they make money. Fear makes people buy things, fear of being left out, and left behind. PC repair shops charge a fortune for repairs that with a little knowledge and research my nine year old son, Benn could do. Gain knowledge in bodybuilding and you can become your own boss, train your self, design your own diets and finally make the gains you desire. Life is too short to waste it on unproductive ventures. A year following the wrong system through ego or pig headedness is a year you could have added 10 lbs of muscle and an inch or more onto your arms by simply training less. Currently one person I train is working out once a week aiming to train his whole body just once a month. He was 205lbs with three years of training under his belt so the following gains were not the 'first gain' we all experience when starting training. But time and money meant that he was limited to what he could do in the gym and what he could buy outside it. He did what every great bodybuilder does - Make the best of any situation to grow. In this case fewer trips to the gym turned into lemonade rather than a lemon. In the last three years he had gained just over 5lbs of pure muscle and dropped 3 lbs of fat. After 6 months of training a body part once a month and he has gained over an inch on his arms and 10 lbs of muscle and dropped 9 lbs of fat! He looks like a different person. Like a bodybuilder no less. Imagine what 10lbs of pure muscle would look like on your frame. We have ten people following the same system as below. Six weeks in they are all pushing up the scales and are looking great. All without drugs - just quality food and some key supplements. Anthony's natural approach to bodybuilding has paid off... Learn more about his life without drugs and how a model has successfully competed in bodybuilding. In addition get the pros and cons of steroid use. When it comes to training the new mantra is 'less is more!' It's something that should replace all these text books that say 5 sets of 10 reps is the key to rapid gains. Of course we have to do something to hit muscles hard but the rule of thumb is - train bloody hard to make the muscle fail and do this in as little time and with as little sets and exercises as possible. Then get out of the gym, rest and eat like h*ll! It's that simple, but who can say they do it time and time again. Not as many as there should be. Click Here For A Printable Log Of Week 3. Click Here For A Printable Log Of Week 4. Make the last four reps hurting on each set not just the last one. He increased the weight each workout, even if it was just a 1/2 lb but never at the expense of good form. Slow reps, 3 seconds up, 3 seconds down. Each exercise has a warm-up of around 30 reps on the pre-exhaust movement. For more information on pre-exhaust view my book the "Manifesto of Mass", or the articles section of Area9.net and indeed the best bodybuilding site on the Net - Bodybuilding.com! So for those who do not like or cannot afford frequent trips to the gym and want to gain rapidly drug free, you have an effective solution - train less to gain more. In regards to diet - eat anything in sight that is edible and not still alive and kicking (training partners for example) and consume no less than three mixed source protein shakes a day on top of your diet. This is the only supplement taken on the plan mentioned above but of course you can take what you wish. We have ten more people trying this out and will report the results in future newsletters. If you want to try out a new routine contact us at coaching@area9.net and we will be happy to see what we can do to put you on the path to your own personal greatness.